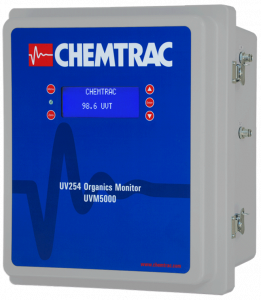 UV254 Organics Monitor | Chemtrac, Inc. The UVM5000 provides online continuous organics monitoring utilizing a 254 nm ultraviolet light source. The amount of light absorbed provides an ongoing indication of natural organic matter (NOM) in a flowing sample and serves as a continuous surrogate measurement for total organic carbon (TOC). 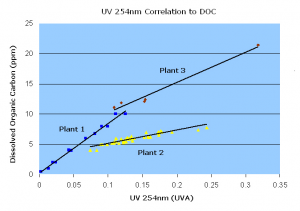 More specifically, UV254 is the best detector of aromatic or reactive organics which when combined with chlorine, can form disinfection by-products (DBPs). 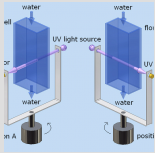 The UVM5000 provides online continuous organics monitoring utilizing a 254 nm ultraviolet light source. The amount of light absorbed provides an ongoing indication of natural organic matter (NOM) in a flowing sample, and serves as a continuous surrogate measurement for total organic carbon (TOC). More specifically, UV254 is the best detector of aromatic or reactive organics which when combined with chlorine, can form disinfection by-products (DBPs). The patent pending Ortho-Beam technology provides many significant advantages while maintaining affordability. The monitor’s unique ability to automatically detect and compensate for UV lamp fluctuations and quartz fouling minimizes losses in accuracy over time, and significantly reduces maintenance.